Brazil, A man who was in the convenience store inside a gas station was murdered yesterday afternoon. According to the MP, the crime happened around 5 PM. A store security camera recorded the murder. 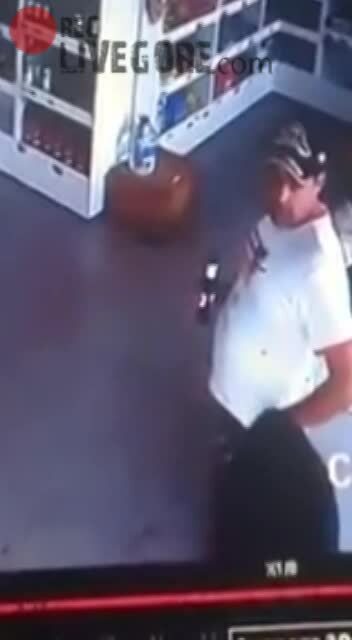 Video shows the man inside the convenience store drinking beer when a person arrived on a black motorcycle wearing a black hoody coming into the gas station. He then passes by the victim and then turns around holding a gun in his hand. The perpetrator of the crime fired at least four times. Frightened, a woman who was in the shop rushes out after the shots. The victim was identified as R. H. V., 36. He worked in a workshop. Three people were taken to the police station suspected of the crime, including two minors who were heard and released. The third suspect was arrested and taken to prison. In a statement, the man told police that the motive for the crime was a hit on the drug trade.